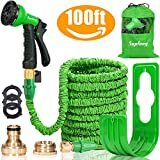 Expandable Garden Hose pipe 100ft Green Water Hose 8 Function Spray with 1"
HOMOZE 50ft Garden Hose - Expandable Water Hose Pipe with 1", 3/4", 1/2"
Suplong Expandable Garden Water Hose Pipe - 100FT Magic Expanding Hose with 3/4"
If you have a lawn, you'll want a convenient way of watering it. 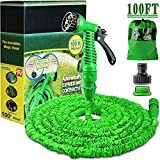 The regular garden hose tends to be heavy, and has a tendency to tangle. An expandable hose is a lightweight and compact way of being able to reach every part of your garden or lawn. Michael Berardi, the inventor, noticed that he could make a tube of rubber that would expand as the water pressure inside it increased—and that gave him the idea for the expandable hose. 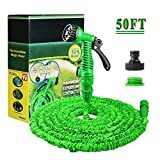 They come in a variety of lengths, and also have a number of settings on the hose nozzle that can help you water different parts of your garden. Here is a guide to some of the best expandable hoses on the market. They are constructed of at least two layers: an expandable rubber inner tube, and a fabric protective outer tube. The inner tube expands according to the pressure of water running through it. The fabric layer expands in length as the rubber inner tube gets wider. All are lightweight compared to the standard type. All expand to 2x or 3x the original size when they are filled with water. The water flow rate and volume is found to be the same as regular hose. When you drain it out, they contract back to the original size. As opposed to a regular hose, even if you tie a knot in an expandable host, water doesn't stop flowing in it. Water will continue to flow through the hose even if you put a kink in it. Various lengths: Typically an expandable hose expands to twice or three times its size without water in it. You'll see hoses that expand to 25, 50, 75, 100, and even 150 feet. 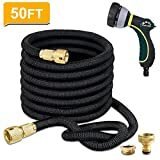 The longer the hose, the more of a loss it'll be if it springs a leak. So you should consider buying the thickest and most rugged possible. Thickness: There are various thicknesses to the hoses, some having a double latex layer, whereas another hose will have 3 layers of rubber. Fabric covering/plastic fittings: If the hose has a thin fabric covering, some people notice that they will tend to crack or leak when subjected to hot summer temperatures. Prefer a thick woven fabric exterior, and a double latex wall interior. Brass fittings: You'll want brass fittings, because brass will not corrode or rust, and will withstand water and summer heat. Hoses that have a plastic fitting that is inserted into a brass fitting will tend to last longer. 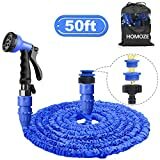 Hose holder: Some hoses come with a hose holder—that will help you pack it away when not in use. It's important that the hose is not exposed to the hot sun, which will cause the material to crack. Thickness of hose: There is no doubt that you should try to get the strongest hose possible. Some hoses have three layers of latex, besides the outer layer of fabric. The extra investment is important, so that the hose is less likely to spring a leak. Hooking up a lawn sprinkler: If you hook up a lawn sprinkler to your expandable hose, make sure to put the sprinkler in place with the water on. And the hose will shrink back to its original size when you turn the water off—and it will pull the sprinkler along with it. Make sure nothing gets in the way as the hose shrinks. Shutoff valve: Look for a nozzle that has a grip handle. Also, it's good if you have a shutoff valve on the nozzle as well. 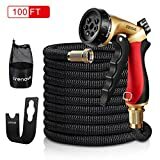 Less durable than the regular hose: People have noticed that the expandable hose may leak at the place of where you place the nozzle. It's good to have spare washers, to insure that the water doesn't leak at the connections. 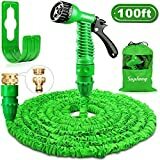 Quality Source Products-- is the maker of a number of sizes of expandable garden hose. Their hose expands to 3 times its size. 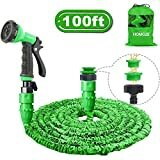 They even make garden hose that can expand to 150 feet. Gardeniar—is a gardening tools company located in Valley Cottage, New York. 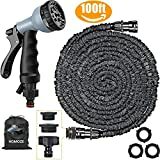 They make expandable garden hoses and spray nozzles with a variety of functions. Bstpower—is a maker of hardware and gardening tools. They also make screwdrivers, pliers, tool kits, and household accessories. Pocket Hose-- is a manufacturer of expandable garden hose. 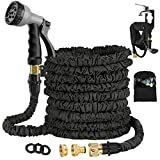 They also make a number of accessories that make the use of their garden hose more versatile: elbow connectors and a pocket hose holder.